So it seems like lately I have been wanting to be under the radar in about all areas of my life, so, naturally, no blog posts. Whoops. The weather being nice, and the prompting of Tabletop day, and the various activities for others have kinda kept me from sewing. That is, unless I employ the “March a long” strategy of sewing after work and sewing daily. Which doesn’t /didn’t happen after March this year. Anyway, I have a few sewing objectives in the last month. My small quilt was picked to be part of the guild group for the upcoming Kansas City Regional Quilt Festival (KCRQF) in less than a month. 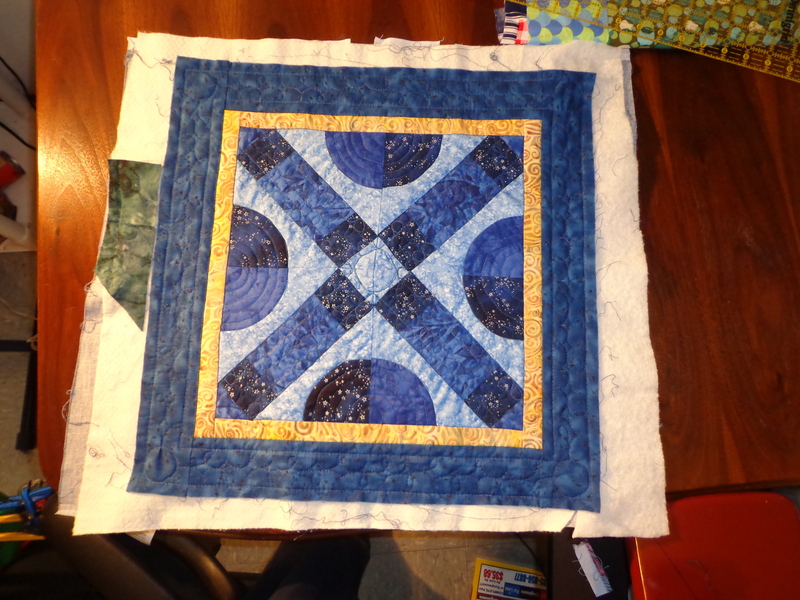 And it wasn’t finished quilting. I did get a start on this right away beginning of april. I did the long figure 8’s and the long thin lines, as what I had decided a year ago on my quilting diagram. But then I went to change it up on the alternate blocks from my original plan. And this is not my best work here, but I really liked the way it brought a different dimension to the quilt with a different type of design. And I froze on it. For a while. Finally decided to press on and complete this quilt. I took one long weekend day to get all the rest of the blocks done, and then put the binding on while sewing at my friend’s house. I forgot to take a picture of this with the binding sewn all the way back. I have since turned it into my guild so they will have it by the time they need it for the show. Next picture I will have will be of it in the show itself. Here’s hoping it still looks ok after not seeing it for a month. I did a large rush job to get it finished by the end of the guild meeting in May, and I’m not proud of that, but it is what it is. 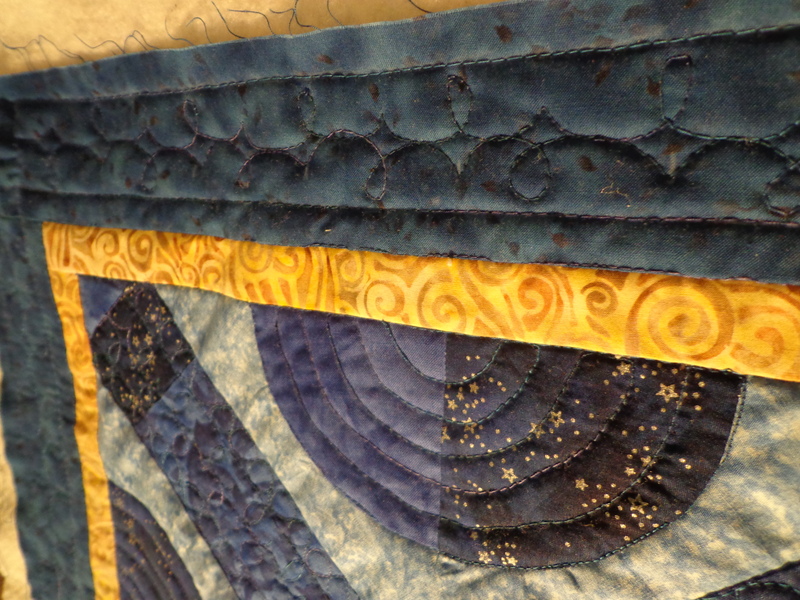 Here’s an up close version of the quilting/quilt. It’s a fun and cute little quilt made with alternating blocks, one of which is called footstool, and one is Grandma’s Choice (modified). So naturally the quilt name is: Grandma’s Footstool. I didn’t make a fancy label for it – usually my quilt labels are printed on from electric quilt onto that printable fabric, but for this one, I just used a pigma micron pen for marking the label. And finally, I got some good quilt fabric for my ladders and bubbles quilt for the border blocks. I went to a quilt shop to help a friend design a quilt for her church, bought a plain blue (with green tint). Later I went to a small quilt show which then prompted me to go to another quilt shop in the area, and actually I found fabric that I liked even better for the borders. This is still in the planning and cutting stage, but mainly I spent time ironing the fabric down to be manageable after getting it prewashed. So now, instead, I’ve been wanting to piece, and wanting to work on older stuff. The blocks that I have been staring at for a while now found their way into my sewing machine. I did massacre the points on this quilt, and if it’s for me, I don’t care. I am considering this as our guild auction quilt for next year’s show for our charity work. It’s small and bright and cheery. And now will need quilted. Or I may not donate it if I think the cut off points show way too little care. The unfinished size of the block was 1.5 inches each. Trying to get other things off my design wall, I decided to next work in stages on the single patch quilt that is the other quilt with these same batik/black leftover quilt bit blocks. I have batched them to help me sew these up better. I don’t really care too very much about colors except for orange. I have an orange stripe (3 of them) that I am trying to keep in diagonal ripples in this quilt. I am actually not batching them in the end, just for the temporary time before all the seams are sewn. I find it cathartic to sew one line of new patches, one line of double patches, and then one line of 4 patches, then I go back to the single new patches, and I am rippling my way through the quilt. I do this so I can keep each line of patchwork straight. I can easily tell what I am sewing and where the next line of patches I need to sew are, and where the newly sewn patches can go. I am curious to know exactly how much fabric I will lose to the seam allowance. This will also be a nice wall hanging but not super big in the very end. But that’s ok with me, easier to swap out in the rest of the house that way! Well there is more to share, but this is enough! 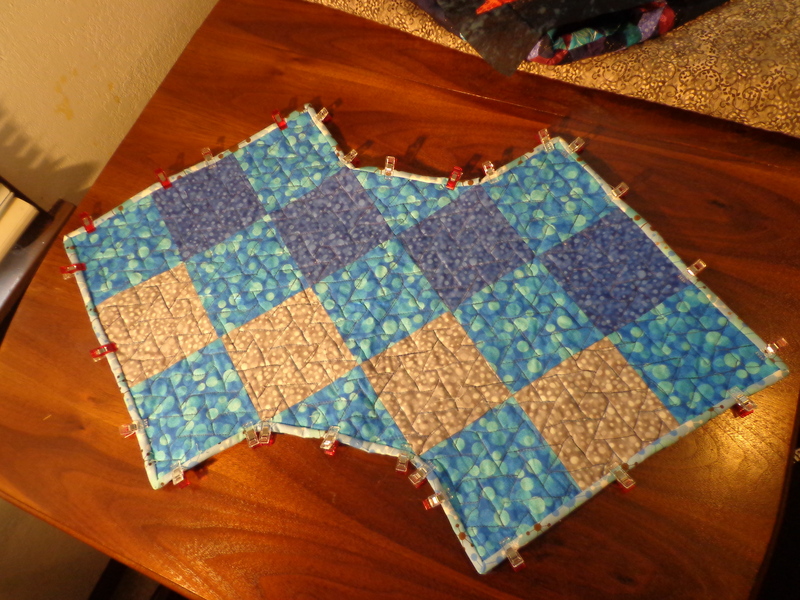 Thanks for letting me share my quilting progress. The past few days are more “march a long” and doing sewing during the work-week as a heads up for the nice long memorial day weekend coming up! Wednesday I worked on 3 little quilts. I did a little more yesterday afternoon (before everyone else started #gdas) and finished up the last one. Well, maybe finished. These are little quilts that I already had backing for, I had to match my batting scraps, Frankenstein one batting together (just a tad too short), and stitch them down to sew. Today I have time to share with you the first little quilt I worked on quilting. As you may be able to see (over the next several posts), these quilts are even smaller than my “don’t panic” quilt. The first little quilt I had purchased the block from Fabric Recycles earlier this year, and I had bordered it a while ago. 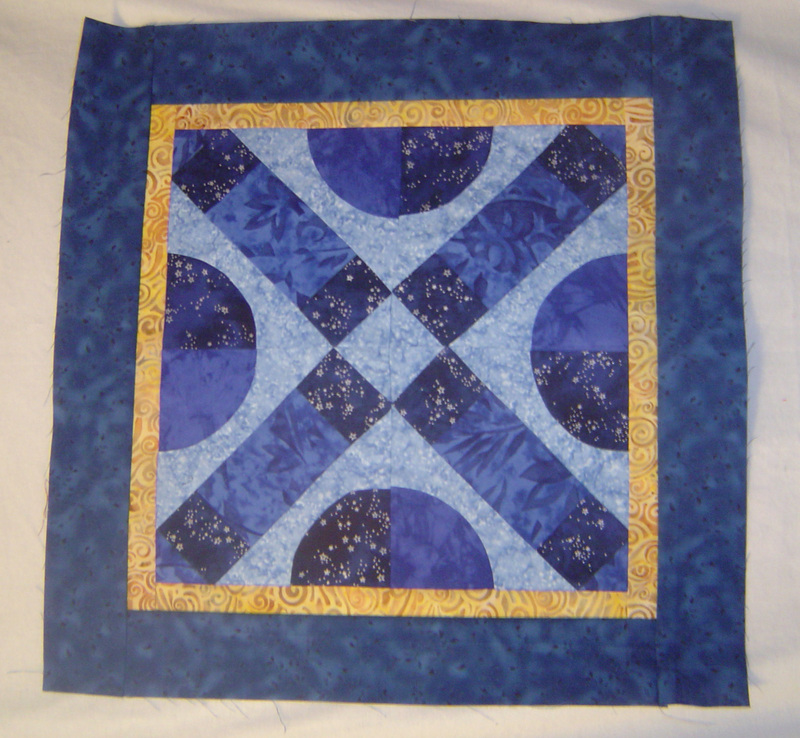 Now I decided to take my recent ventures into FMQ and go to town on this quilt. This probably has a little “too much FMQ” all in the same area. 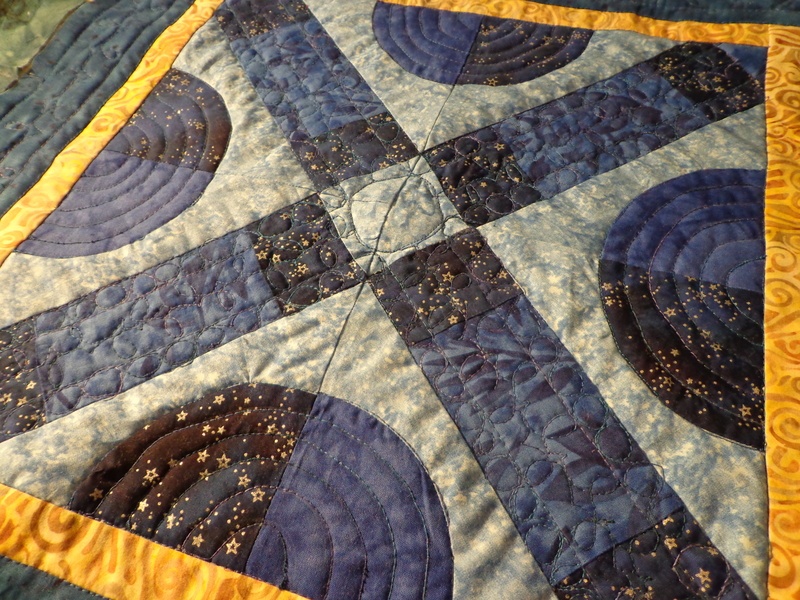 As you can see, I have circles around the circles, and lines of quilting on the X’s (I may just applique a star in the middle of the quilt, don’t like the circle I ended up making). Here are some better pictures of this little quilt. Hmm. I can see this better when I zoom out, but I have rows of pearls quilted along the X, but in the middle of the rows I have some “l’s and upsidedown v’s”. Its the same pattern I have in the borders. 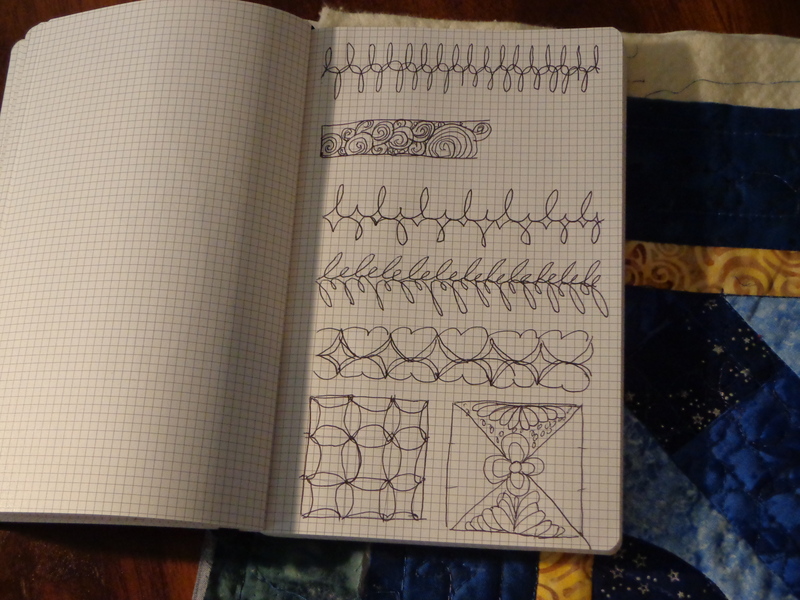 Which is a cute pattern I drew in my notebook a while ago when I wasn’t stitching anything. 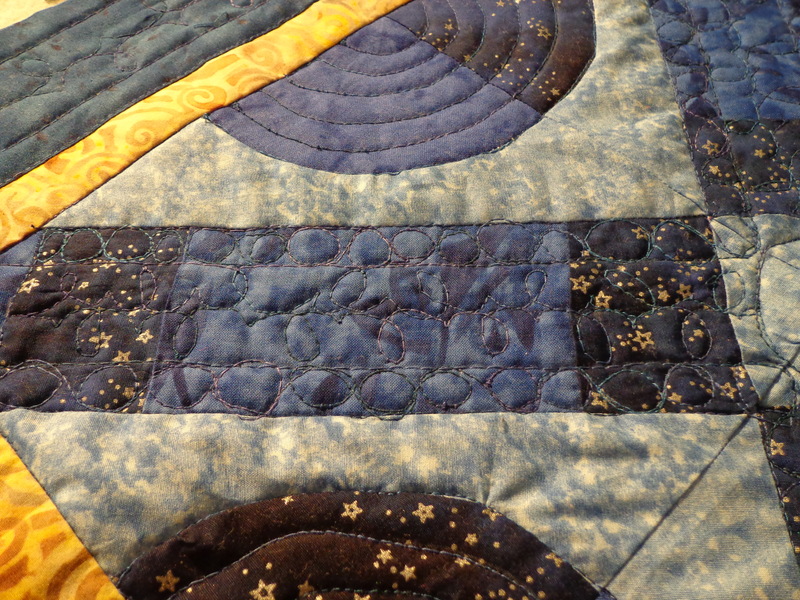 Here’s a final picture of the little star quilt showing the whole thing. 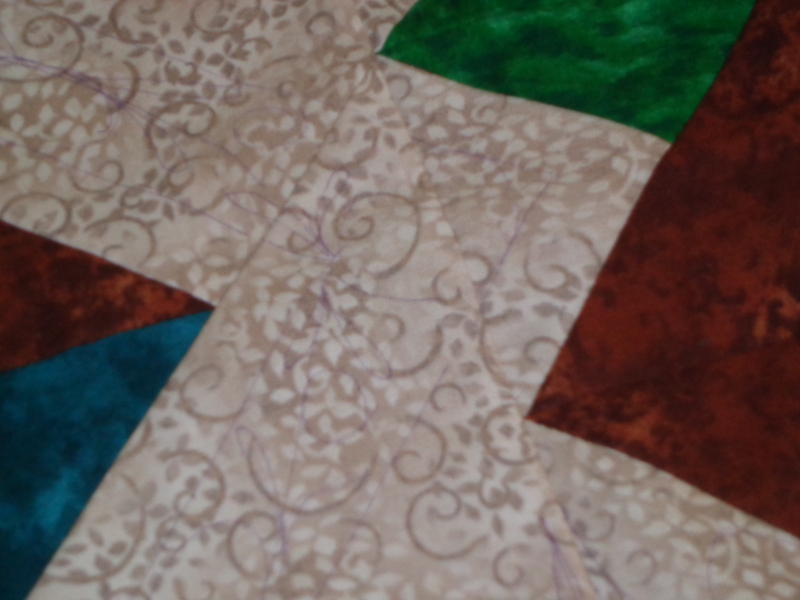 One of my favorite Craftsy tips on FMQ is from the beyond basics Free Motion quilting class is to give yourself a little area just off the side of the quilt to correct tension issues on the quilt before starting. This is the little green patch of fabric to the left of my previous picture. This allowed me to play a lot with my tension before committing the stitches to the quilt. Like how this turned out. Except the center circle, but again, a yellow/gold applique star will just do the trick there! Thank you for the comments on my last post. Due to the response I received from the last post, and a lack of hurtful comments, I am starting to feel a little more brave. To be fair, in my last post I should have said that the comments came on a personal site, and I was afraid that they would be transferred to my public site. I know that sounds weird, but the comments I received really really hurt me, and from my perspective all started out of left field at the beginning of the month, escalating to just before I posted the last post. Completely out of context and with full intention just to hurt me to gain my attention. As an adult, I should really know how to deal with it better, but time away and separating myself from the comments & the commenters felt like the best solution possible. This blog post will still be moderated for all comments, as I am only a little bit sure that this site will be left fully unharmed. But I am more sure than I was 2 weeks ago. So since I have heard so so much about the healing powers of quilting, I decided to channel my negative energy in some of these near-finishes. I started drawing one day after lunch and I just felt inspired to mark up a quilt top with some interesting custom quilting. There are marks all over the square in a square blocks, marks all over the borders, circles and lines in the quilt top. And the frixion pen is what marked it all up. Can’t see “too well” in this picture, but the actual quilt is all I need to actually quilt this. So that’s quilt #1 that I got further along on the quilting. 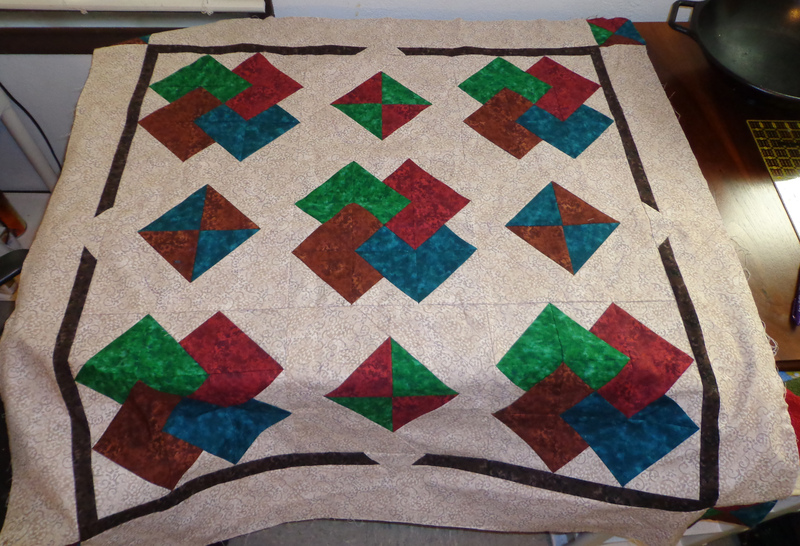 Then the 2nd quilt I got out to finish was actually basted. 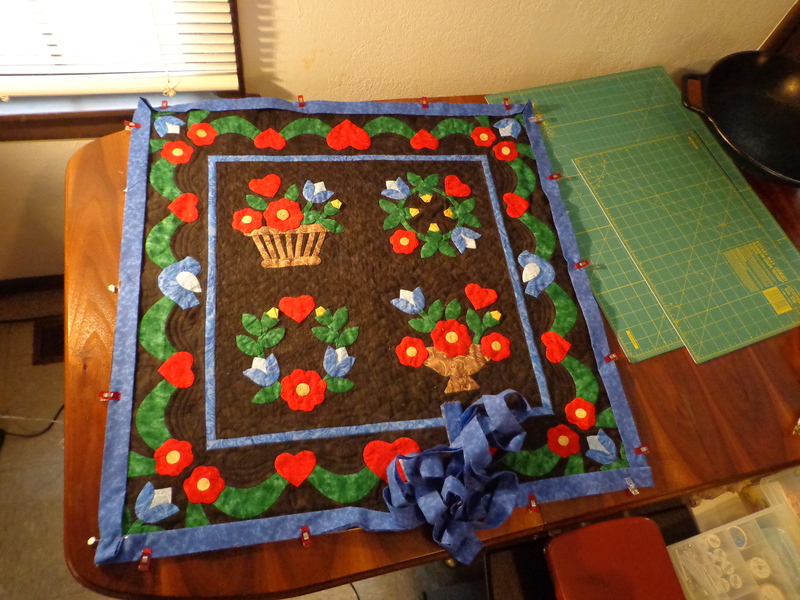 And sitting in a hand quilting frame. For 2 years. So I put on an audiobook that I liked, that I’ve listened to, that I am familiar with. 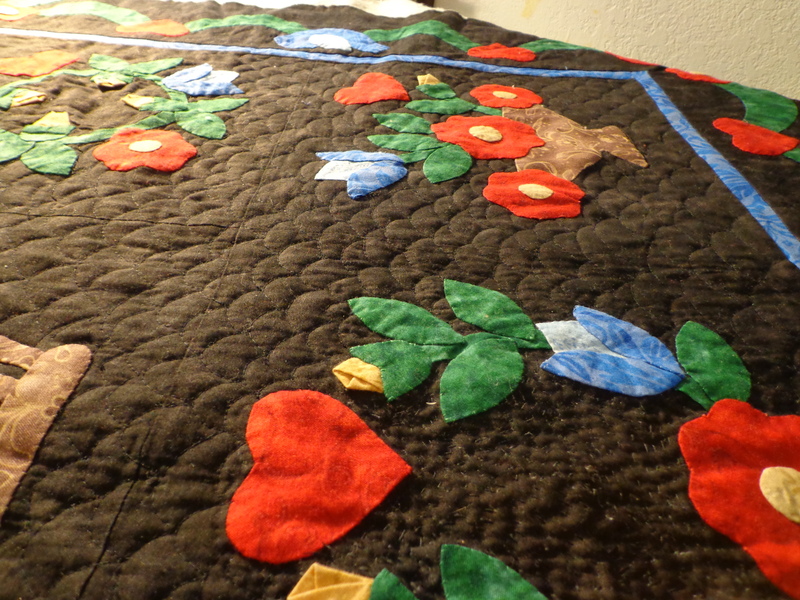 I pulled a few hand quilting stitches, and proceeded to get the space ready for machine quilting. Machine FMQ. Which this quilt I decided to clamshell quilt over the entire center section. Which was fun and free form. I did a little border work, all free form. And then matched the binding with a blue purple that I’ve recently bought, since that’s my favorite color in the quilt. 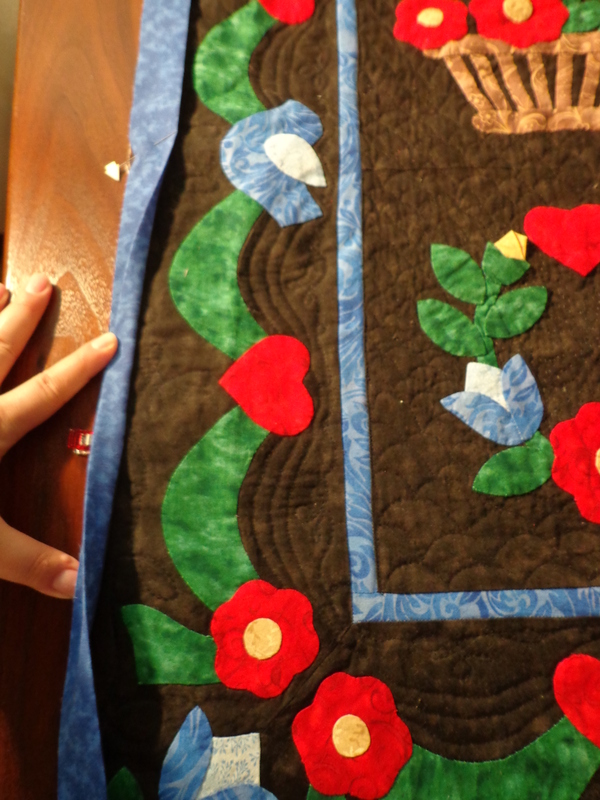 And I decided, after confirming with a few people, not to FMQ over the applique on this quilt, even though I could bring out the petal detail of the flowers and a little more detail on the green ribbon. 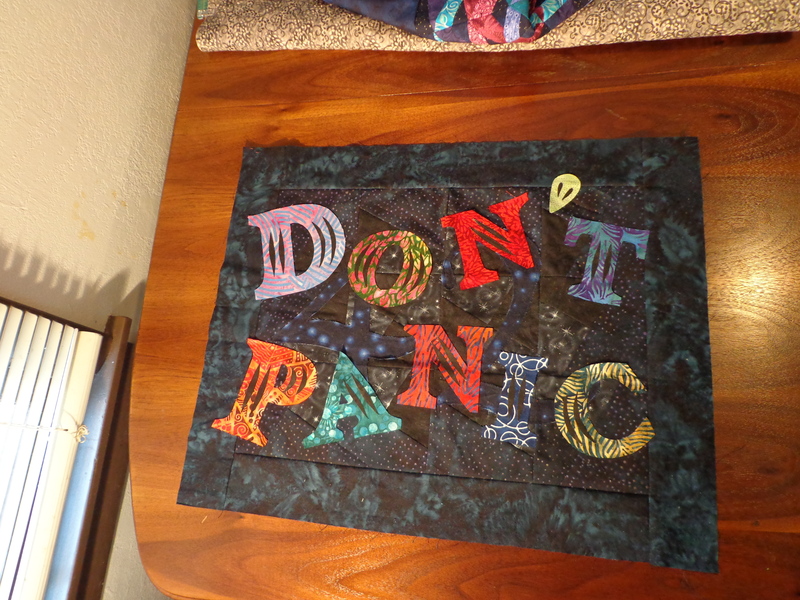 And I also decided while I had my darning foot out to sew down over the secret to life, the universe & everything, and then glue my ‘don’t panic’ letters down onto the quilt. I got out my fancy, expensive aurifil invisible thread to sew all these letters down. But I wanted to use regular cotton thread on the bottom. Which, I found out will not work for the tension discs on my sewing machine are too loose, at the loosest setting, I was getting the little puckers at the back showing through to the front. I was sewing down 3 layers on those black pieces and then the tension worked fine. So with a little more padding, I can quilt with the aurifil thread. I may just quilt with the batting instead of sewing everything down first. Just for tension issues. Which means I have to dig through my batting and find the pieces that will fit this quilt. So a plan is in place for this quilt. And there was a cooler color quilt with a weird shape which was a result of a discarded piece of an apron I made a long time ago. Which only needed binding. And here’s the binding on it. Actually I’m going to make 2 sleeves for this quilt, one horizontal and one vertical. I love that idea of having both on the same quilt! So, in any event, I may have done a few other things, such as guild member embroidery projects, but I have been taking some negative energy & turning it positive. Thanks for helping me feel a little bit braver. This past week has made a world of difference, but I do know still, that some time, some where, a potentially more bad slattering of things may come out again. I really haven’t ‘dealt’ with the problem except for with distance. And currently the distance has helped me. But to actually heal and be able to fully move on, I know I’ll need a very very long time. And as a result, may be harder for me to go back to my home town for a very very long time. Which is kinda sad, but I can’t risk getting hurt by someone I trust in the same way again. Not until I’m ready.